Zero loss this week. I worked out 3 times with the Wii sweat workout and a couple of easy bike rides with the kids followed by a BIG Sunday tea at my mum and dad's. I reckon tomorrow it'll all be good but I weigh in on a Monday and that's that. I'm 13 stone 2lbs in case any of you have forgotten. Prior to the blog I weighed 16 stone 5lb and 14 stone 5lb when I started writing 18 months ago. Yes, I appreciate I'm not a Hare on the dieting front as my dad, in his less than tactful manner pointed out, but I never claimed to be. I'm a normal mum of 3 who is still trying to lose her excess baggage following on from a rather indulgent 3rd pregnancy (yes I should have known better) which mainly consisted of a 10.30 am cake of my choice, followed by half a baguette with prawn mayo, which was accompanied with a large bag of cheese balls! I would like to think that's why people read my blog as they can identify with my weight loss journey. Today I reached over the 100,000 views mark so I must be doing something right and I never ever would have imagined that kind of audience when I first started. 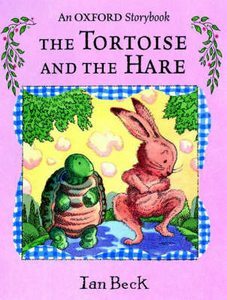 The Tortoise and the Hare book - pic ebay - I think the Tortoise looks like a nice chap! I'm still okay with this. I've got into a nice little routine at the moment and Buddy will now be going to pre-school on a Friday morning. This will make it 3 mornings a week. As it stands Monday's seem to just be cleaning so that extra morning will come in very handy. In today's paper there was an article saying you can diet and eat cake. Yes it was that Dukan diet of which I have talked about here. I normally just skip right past these articles but today I had a little look just to see what they were banging on about now. So if you want to eat a bit of cake whilst on this diet then you will need these ingredients; powdered milk, canderal granules, mandarin flavouring (?! ), sugar free fat reduced cocoa powder, oat bran, wheat bran, splenda granules, liquid hermesetas(WTF!) and an assortment of flavourings. I'd rather eat sawdust wouldn't you? If you want a treat eat the real natural variety and leave the chemical factory to the Dukan Donuts!